what size is that frame, 19in? Just met a local guy who has a triple butted Project 2, Paul's single speed wheelset and, a number of stems that would work perfect for this bike! Biggest problem is I will need to give up some classic parts for the trade, it will be worth it though. Reasoning behind the rigid fork is because I fully intent on riding the bike, which means a lot of stand and grind up hills. With a sus fork there is just too much bobbing for my tastes. I will update as always. ride the judy while he paints the other stuff. win/win. Unfortunately the Judy/Syncros are both 1". I've thought about looking for a new 1 1/8" crown because the Judy is freshly rebuilt, has a sweet Risse cartridge and replacement springs. Anyway i'm excited to proceed on this build! easy to find the 1 1/8 crown. the opposite is tough. An old judy is an old judy, the playschool of suspension. hmm.. a salsa steel stem wouldn't work that bad..
Indy fork would be the perfect match and I might go in that direction depending on how my part quest goes today. If all goes as planned I should have a fork, stem, and rear hub (or wheelset) later today! I will say that the Syncros stem is on my top 10 list of favorite vintage parts for both looks and functionality. If it was the correct size I would use it for sure. i switched to a salsa ahead stem with a 99 sid xc on mine recently, and i know what is meant with the "pain in the ..." of a "non removeable faceplate". on the other hand i smile all day long since it's done. Had a productive and (relatively) expensive parts day yesterday. Unfortunately my parts guy wasn't interested in trading so i'll need to squirrel away some cash before I pick everything up. 1995 Kona P2 TB fork, flat-grey color. Not the fanciest fork but it will fit perfect and comes in at 800g's, it is threaded and has nice cast dropouts. I hope to have this and the stem repainted. Stem, not sure yet. He is going to do some rummaging to find a 120mm quill with a cable guide. My guess is either Control Tech or Kona. Guy is a huge Kona fan and has at least 4 Hot's including a Tet built one. Wheels. Paul's singlespeed rear with WI freewheel, ugly Salsa rim. 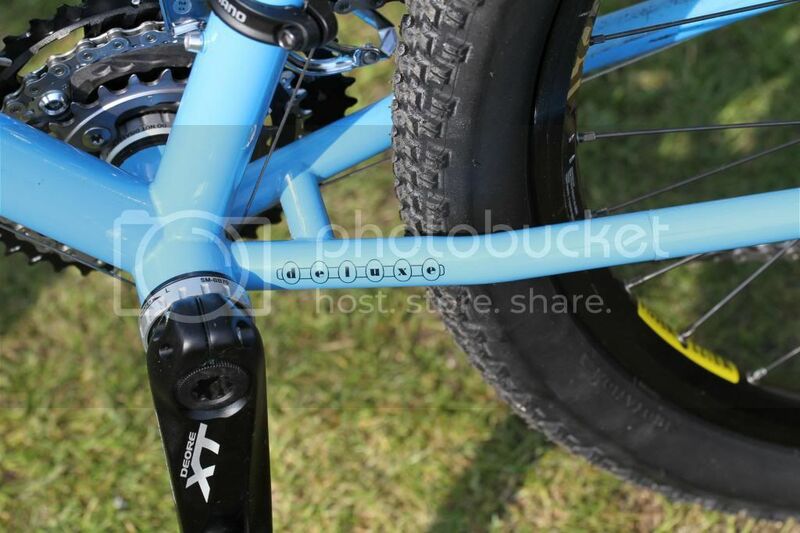 Front hub is a Black Ringle with nice Mavic 231. I'm still hoping to swap rims/spokes with late 80's Weimann's. I really like these rims, very wide and ever so shiny which is the look i'm going for. Another option is to go with new rim brake Stan's so I can run tubeless and drop the pressure to soften the ride a little. Brake levers. He has a set of Machine Tech Zero Flex! Perfect because i'm planning on using MT Zero Flex cantis. Sorry guys. So parts cache is almost complete, just need a saddle, handlebar, bottom bracket, tires, chainring and chain. That is a supreme bar Sneb! So... are you buying one of those Hots??? I would consider a Hot is the price was right, honestly though my knowledge of Kona's is practically zero. You need to know your size and that's all. I happen to like t bone quill stems and they used to pop on ebay at nice, comfy prices. MOstly 135mm though. You can always go crazy with an Ibis titanium stem... if you have 200 dollars burning a hole in your wallet. 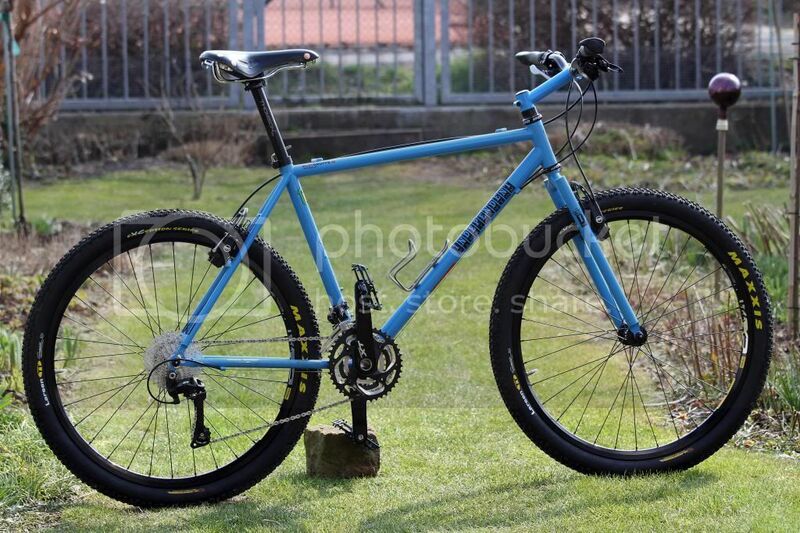 i tried a kona p2 triple butted with a-c 410 or 415(? can't remember right now). they made a fast around the corner ride, and i kept this for more than 2 years. if you're on budget or wanting to figure out what fits best, i would give them a try. mine were threaded, and i completed it with a 2nut king and a really nice bontrager stem-bar-combo (bar was glued and riveted to the quilled stem). in sum it was the lightest, stable solution for the price i was able to find. to figure out, if it is a triple butted p2, watch out for a "TP" at the steerer. it's hard to read sometimes. I still say a Salsa Cromato is a nice properly sized, properly raked fork for cheap...425mm A2C. Fork is stamped 1995 TB, which I assume means made in 1995 and is triple butted, weighs a 800g, and has the nice cast dropouts. Classy looking fork and I hope won't throw the geometry off too much and i'm hoping it will be a little compliant, though that doesn't matter too much to me. I prefer climbing efficiency over downhill prowess. I haven't measured the axle to crown but from the attached pic it looks quite long. Would anybody know what the length should be? IF said it was designed for a 80mm travel fork. Even though my build doesn't appeal to everybody i'm seriously loving the stance and look right now. The simple straight lines remind me of the old school look that I dig so much. Length should be around 420mm but more important is how you like the bike's behaviour. One measure is to build a rim brake 650B wheel w/ Paul's brakes which have enough adjustablity. That would be awesome as style and function. it would bring back the stability, slow the manners of the bike. Actually it would ride better than everything else and look classy. zamfir, i liked the ride with the kona p2 (a-c 410, i checked) more, than what i felt with a chris kelly that came with 420mm a-c. much more yo-feeling with the shorter forks. it's a question of personal taste, a little voodoo and whatever. i'm not sure if i could check the difference in a blindfolded test, if this would be an option in this sport. if if talk about an 80mm sus fork, i think they suggest something that is more around 420 than 410mm. you could level it by choosing a higher building tire for the front. i think this 410mm tb p2 forks of around 1995 were the best kona ever made. the longer ones from later years i've seen were not my cup of tea. they were different in butting, the dropouts looked cheaper and even the diameter of the tubes was bigger. weight was always in direction of 1000g and more for the later ones. I agree that the P2 fork I have is above average in design and execution from others that i've seen, it even has a swagged steerer tube. Welds are clearly not the finest but heck, the price was right! "I noticed one bearing is missing"
i would place the hole on 9 or 3 o'clock when installing and try to forget. I definitely had a wtf moment when I saw the missing bearing. Slowly I cooled off with a fine belgian ale, with hazy vision and thought I managed to pry out the inner race out and freed the bearings. Replaced the missing, greased and i'm good to go now, hooray for progress and tasty beer! Another baby step forward to completion. Scored a wheelset yesterday. Ringle front hub on a Mavic 231 and a Paul's rear (WI freewheel) on a Salsa Gordo rim. To say these wheels do not match is a understatement. Silver rims and spokes up front, black rims and spokes on the back. Ergh......Both wheels have thick plain gauge spokes and weigh far too much. Plan at the moment is to re-lace the wheels with rims and spokes from my old Nuke Proof set which I disassembled after I noticed cracking of both hubs. Rims will be Mavic 231's, Wheelsmith db spokes, blue nips. Minor update. Finally finished relacing my ss wheelset. 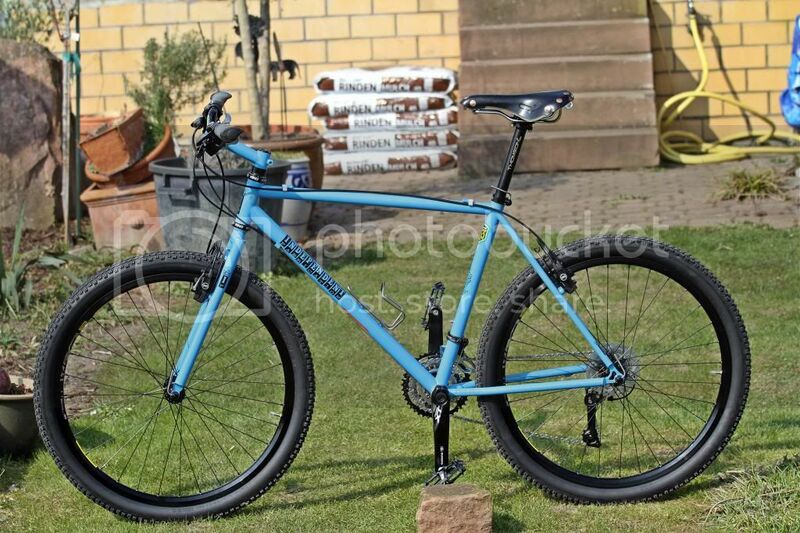 DB Weimann stainless spokes, blue nips, Mavic 231 rims. Paul rear hub and Ringle' front. very nice hubs ...look forward to seeing more. Minor photo update, though I have made more progress with collecting parts for this build. Found this old GT stem locally with a nice rise and reach, it also has a cable guide (yeah!). Ignore the color for now as I hope to have the fork and stem repainted. I do like the neon red, I just think it clashes with the frame. I also located a pair of Ritchey brake levers and M920 cranks which just about finish off my parts list, just need to find a saddle and cable guide for the rear brake and build this sucker up. It's going to be a sweet ride! It looks like no other stem i've seen on Ifs and that goes w/ the spirit of SS. well done. The stem is a odd design, clearly inspired by the Grove Hammerhead. Despite the color I think it works with the build and will fit me just right. With a repaint it'll bring it all together, I hope. Wow, how did you get such an early one? 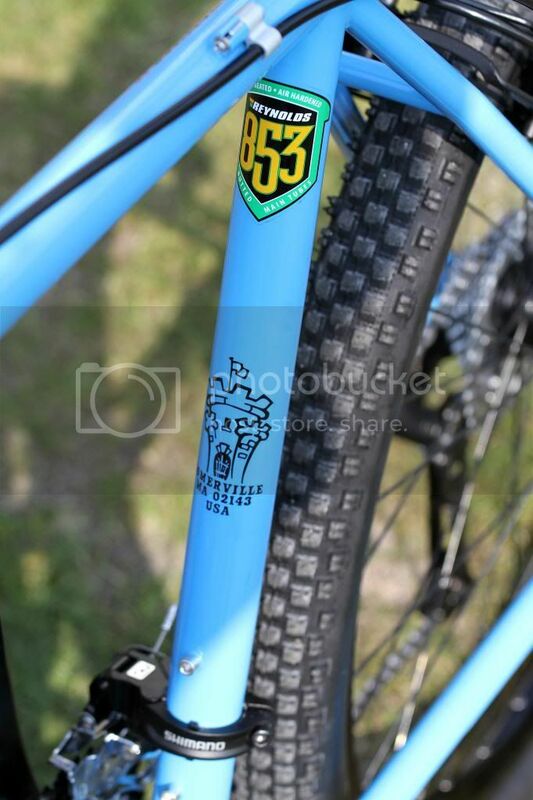 here is my 98er Porsche Riviera Blue Independent Fabrication steel deluxe. Built up with Magura HS33 and Shimano 785 XT parts. My all around carefree bike. My understanding from buddy of mine who raced for them very early on and is still friends with some of the founders is that the first dozen or so went to IF employees, girlfriends and racers. It's pretty neat you wound up with one of those. So many amazing bikes, thank you for sharing. I'm a bit stalled on my build at the moment, can't seem to find a BB-930 (bottom bracket) locally and the 'bay ones are a bit spendy. Time is ticking away though, 6 short weeks until the 24hr race! I'm hoping to have Indy ready by then. Wow, that is a nice bike. It looks a bit like the blue Indy Fad Deluxe redux..... Similar color, same group.